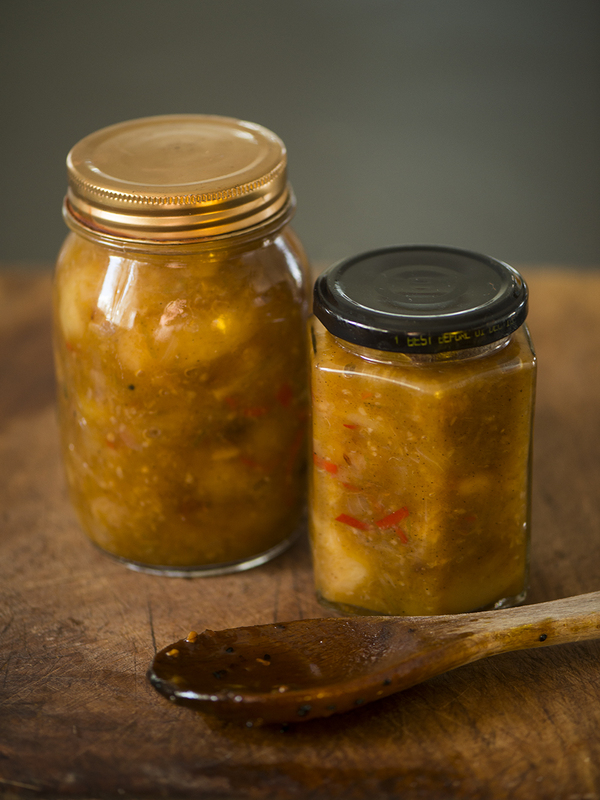 This experimental recipe was inspired by the fact that Margie was hanging out for another batch of Spiced Peach Chutney and that Brisbane has had a bumper crop of mangoes due to the dry season in 2000. I simply could not bear to see all those mangoes at the top of Dublin Street rotting in the gutter. Heat olive oil in a heavy based saucepan over moderate heat. Add chillies, ginger and garlic and sweat until soft. Add onion and cook until onion is soft. Grate the zest from limes. Remove all peel, pith and seeds, then roughly dice the flesh. In a separate saucepan, combine brown sugar and white wine vinegar and stir over medium heat until sugar dissolves. Add sugar and vinegar to the other ingredients, add allspice (if using) and sea salt. Simmer for 1 hour or until mixture becomes quite tacky and has a chutney consistency. Spoon hot mixture into sterilized jars and seal whilst hot. Store in a cool dark place until opened and then store in the refrigerator after jars are opened.